Homemade Pasta Is the Heart of Sette Orlando — Rona. Sashay on over to Sette (it’s pronounced se-TAY) and treat yourself to homemade pasta – and more Italian-influenced hand-crafted foods – at this new restaurant in Orlando’s Ivanhoe Village neighborhood. With 150 seats inside and out, Sette was developed to serve the types of Italian fare one might find on the sidestreet of a hipster Brooklyn neighborhood. You’ll find red sauce here, and it’s good, but Sette is more about lemons and vegetables, olive oil and Parmesan, than it is the parmigiana-type dishes most popular in Central Florida. In keeping with the theme of the couple’s first restaurant, the bakery-café Se7en Bites, Sette offers seven red wines and seven white ones. (Oh, and Sette means “seven” in Italian, Trina says.) The cocktails are as lovingly made as the food, and they tend to be garnished with wedges or sprigs of fresh fruits or herbs. This dessert looks so bland I’m surprised Sette Orlando served it at the media dinner. ORDER IT! 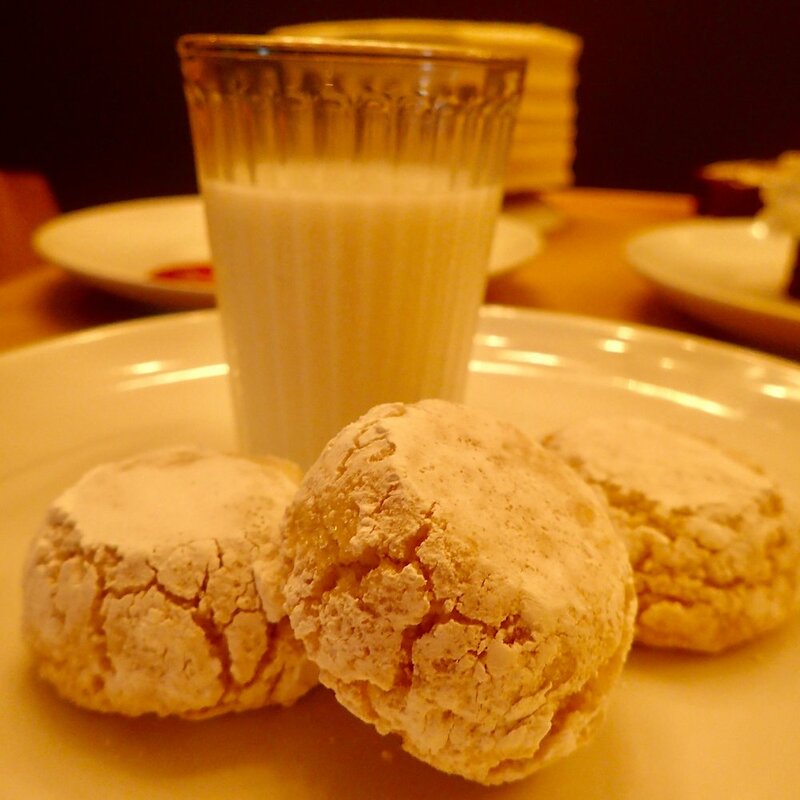 It’s chewy house-baked almond-flavored amaretti cookies with “milk” spiked with a white-chocolate liqueur. The dining room is simple and rustic-chic, with a big patio, a warm bar and a rectangular cut-out that lets you see the culinary team at work. I was lucky enough to taste several dishes at a media dinner hosted by chefs and co-owners Trina Gregory-Propst and V.A. Probst last night. That’s where I took these photographs. Vegetarian meatballs made with eggplant. They’re good enough that meat eaters will order them too. Sette will open to the public on Friday, March 22. Enjoy. Another dullard visually, this antipasta may well be my favorite. It’s called Sausage with Grapes, and indeed it’s chunks of Italian sausage, blistered graves and a subtle wisp of fennel. I’m a fan. The website’s not live yet, but when it is it’ll be at setteitalian.com. Housemade linguine with smallneck clams, pancetta, fennel and fronds in a lemon-white wine sauce at Sette Orlando.